Amaircare 90002287 8-inch Easy-Twist HEPA Filter for Amaircare 2500ET Air Purifier. 90002287 There is 1 product. Amaircare 90-A-08ME-ET 8-inch Easy-Twist HEPA Filter is Amaircare original filter. 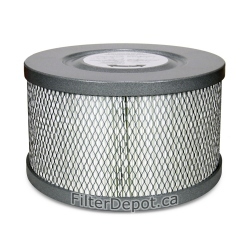 Amaircare 90-A-08ME-ET HEPA filter fits Amaircare air purifiers with 8-inch Easy-Twist HEPA filter.